Gently whisk the eggs in a bowl with a fork and stir in the milk and melted butter. Mix in the grated cheese, feta, spinach, sundried tomatoes and chives and mix again. Add in the flour and some salt and pepper and fold until just combined. Use an ice cream scoop to divide the mixture between the 12 muffin cases. 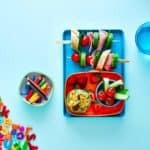 To make the sandwich skewers simply add all the ingredients onto skewers or sticks (ensure you use age-appropriate skewers). These muffins are best kept in the fridge for up to 3 days. They can be eaten cold, brought to room temperature or warmed in the oven or microwave. They can also be frozen once they have cooled completely. To defrost simply leave out for a few hours or overnight.